For the 1944 film, see Lady in the Dark (film). Lady in the Dark is a musical with music by Kurt Weill, lyrics by Ira Gershwin and book and direction by Moss Hart. It was produced by Sam Harris. The protagonist, Liza Elliott, is the unhappy female editor of a fashion magazine, Allure, who is undergoing psychoanalysis. The musical ran on Broadway in 1941, in the United Kingdom in 1981, and was also made into a 1944 film and a live 1954 television special. The musical's theme of psychoanalysis is said to be based on Hart's own experiences with psychoanalyst Gregory Zilboorg. Except for the final song, all the music in the play is heard in three extended dream sequences: the Glamour Dream, the Wedding Dream, and the Circus Dream which, to some extent, become three small operettas integrated into a straight play. The final song, "My Ship", functions as a leitmotif for Liza's insecurity: as each dream commences, a snippet of the tune is heard, as it is a haunting melody which Liza recognizes but cannot name, or sing with words, until her anxiety is resolved. The musical opened on Broadway at the Alvin Theatre (now the Neil Simon) on January 23, 1941 and closed on May 30, 1942 after 467 performances. Direction was by Hart, produced by Sam H. Harris, with musical staging by Hassard Short, who also was the production designer, and choreography by Albertina Rasch. The original cast included Gertrude Lawrence, Danny Kaye, Bert Lytell, Victor Mature, Margaret Dale, Davis Cunningham and Macdonald Carey. Kaye's performance as fashion photographer Russell Paxton, and particularly his consistently showstopping performance of the patter song "Tschaikowsky (and Other Russians)" in which he dashes through the names of 50 Russian composers in 39 seconds, made him a star. The musical went on an eight city tour for 160 performances, and also played on the West Coast, including Los Angeles and San Francisco, for 56 performances. The show then ran at The Broadway Theatre from February 27 through May 15, 1943, for 83 performances. Gertrude Lawrence reprised her role as Liza Elliott in all venues. Lady in the Dark premiered in the United Kingdom on December 9, 1981, at Nottingham Playhouse, Nottingham; Celeste Holm, in her British debut, starred. A New York City Center Encores! semi-staged concert was produced in New York in May 1994 with Christine Ebersole. The musical opened on the West End at the Royal National Theatre, London, on March 11, running through August 2, 1997, directed by Francesca Zambello and starring Maria Friedman. The production received the Evening Standard Award for Best Musical. A production was staged by Philadelphia's Prince Music Theatre in the autumn of 2001, with Andrea Marcovicci as Liza Elliott. A production by MasterVoices, directed and conducted by Ted Sperling, choreographed by Doug Varone, and starring Victoria Clark as Liza Elliott will take place at New York City Center on April 25, 26, and 27, 2019. This production will feature MasterVoices' 120 singers, the Orchestra of St. Luke's, and Doug Varone and Dancers. The 1944 film version starred Ginger Rogers and Ray Milland. The film cut most of the Weill/Gershwin songs, though "The Saga of Jenny" and "Girl of the Moment" remained, and part of "This Is New" is played by a nightclub band in the background. "My Ship" was heard as background music, but never sung, even though the music was constantly referred to in the story. Kaye's role went to Hollywood's "Mad Russian," the slightly taller Mischa Auer. 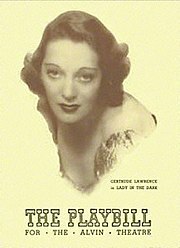 Lady in the Dark had been adapted various times for the radio, in 1947, 1950 and in 1953. Judy Garland starred in a CBS production for Lux Radio Theatre alongside John Lund (actor). For Theatre Guild on the Air. Gertrude Lawrence reprised her role both times and Keene Crockett played Russell. On January 29, 1945, Ginger Rogers performed the role of Liza opposite Ray Milland in the CBS Radio series Lux Radio Theater adaptation of the show. The musical was broadcast on NBC Television on September 25, 1954, as part of an intermittent series under the umbrella title Max Liebman Presents. Ann Sothern played Liza, and Carleton Carpenter played Russell. A cast recording of the TV special was released on Sepia. Although recordings of individual songs were made, no attempt was made to record the entire score until 1963, when Lehman Engel produced a stereo studio recording for Columbia, starring Risë Stevens, Roger White, and Adolph Green. This recording was reissued as a Masterworks Heritage CD, MHK 62869. The reissue also includes five 1941 mono recordings of songs (including "Tschaikowsky") sung by Danny Kaye. According to the liner notes, the maximum playing time of an LP did not permit including everything, and some cuts were made (not specified, but mostly in the number of verses or repeats). The Royal National Theatre revival in 1997 led to the first complete recording of the score (TER/JAY). A telecast from February 11, 1981 Musical Comedy Tonight II presented Danny Kaye (from the original cast), Lynn Redgrave, and others reenacting the circus scene from the original production of "Lady in the Dark," including Kaye's hit song "Tchaikovsky". Life Magazine wrote that "with its unique blend of serious drama, musical comedy and pageantry, Lady in the Dark is a grand-scale smash hit." This page was last edited on 27 March 2019, at 16:48 (UTC).